In this episode, a lot of cute things happen. 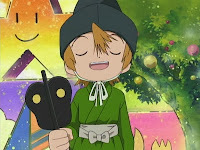 Cute kid, cute village, cute baby Digimon, cute fighting, cute flashback... cute way to spend time not doing anything. About halfway through watching this episode, it dawned on me that absolutely nothing was going to happen. My worst fears were realized when not only did Patamon not digivolve, but they didn't even turn the island back toward Infinity Mountain. Without a dangerous enemy, huge action scene or trademark evolution sequence, there's no sense of pace to it. It just kinda goes... and then it kinda stops. The good news is that TK finally has an episode all to himself, waiting far too long considering that there's been something like three Joe episodes already. I'll get to him in a second, but the episode is the first time it hit me over the head: he really does have the same voice actress as Haruhi Suzumiya. Maybe I just wasn't paying attention to him before, but when TK is the only one in the episode, it's really obvious and even a bit distracting at times. Digimon predates Haruhi by several years, but that's what happens when you let a show fade into history like that. It's much more amusing in reverse, like Takaya in Persona 3 sounding like the Digimon Emperor. 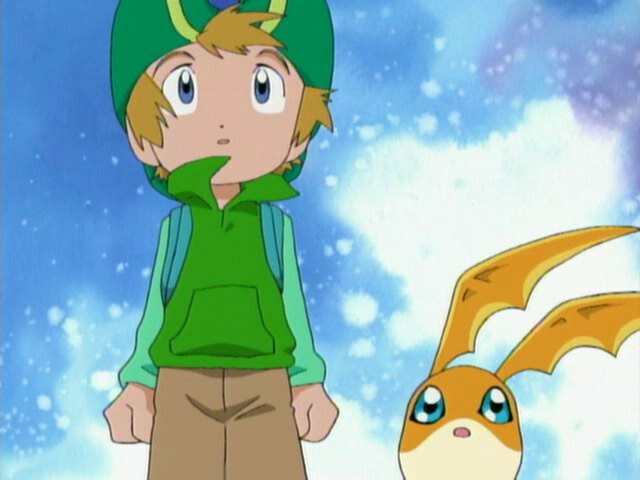 Appropriate that the first few minutes of the show feature the melancholy of Takeru Takaishi as he and Patamon wander alone, helpless and frightened. The railroad crossing from Haruhi even makes a cameo appearance! There are a few cute moments early on, like TK speculating on Patamon's Champion form (all involving pigs for some reason), but nothing can brace you for what lies in Primary Village. Let's run through this: TK and Patamon enjoying the fluffy bouncy side of Primary Village is fun. The little baby Digimon are squishy and adorable. The flashback with Matt is sweet. The fighting between Elecmon and Patamon is silly. Their subsequent tug-of-war is just plain cute. It's like Haruhi called for the land to be covered in moe. It would all be a nice respite from the more serious side of the show... if we didn't just get one last episode. At least we get a more rounded glimpse of TK. Either he's in denial about the danger of this world or he still hasn't completely grasped it yet. It creates an interesting duality when he's alone. Normally, he reaches his breaking point faster than anybody as he and Patamon burst into tears pretty quickly, desperately wishing the others would show up. Once they hit Primary Village, they're quick to forget their problems and have a blast with no concern for anything else. He also really hates violence, even the toothless fight between Patamon and Elecmon. It's suggested that fighting within his family has led him to this. It's funny that I spent the first part of the episode in awe that this little kid eventually turns into the TK from season two, yet completely forgot that this disdain for violence is totally consistent with TK from season two. It seemed confusing to show digivice shots intimating that Patamon was close to evolving but TK wasn't going to have it, but that may have been because I knew it wasn't going to happen here. Or that evolving to take down someone like Elecmon would have just been unfair. Elecmon's just stupid. 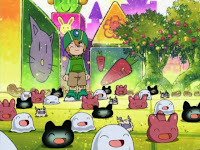 He drops the babies' dinner at the first sign of trouble, assumes TK and Patamon are hostile trespassers without talking to them first, he starts a fight with Patamon that endangers his charges, agrees to a tug-of-war that he is less certain to win, then assumes that TK and Patamon are friendly just because Patamon beat him in a contest of strength. Someone get these kids in foster care. Something could be said about this episode explaining the nature of how Digimon are born, providing some information that could be useful down the line, but it doesn't say anything about Digimon dying or being reborn. That would have been useful... not that there's any chance one of the beloved Digimon might actually die. Patamon imagining what Biyomon would do in his situation has a cute punchline (evolve to Birdramon and fly the hell away), and provides the only evolution sequence in the whole episode, but choosing Biyomon is really out of nowhere. There's speculation that Patamon views Biyomon as a big sister, but a little more elaboration would be nice. Patamon finds a note under a digiegg that he claims is digicode, even though it is clearly written in hiragana. Such treatment of the Japanese language is an unfortunate remnant of Saturday morning dubbed anime, but it's particularly gruesome since there is actually a written digicode language based off of hiragana, featured in both episodes where Izzy nestles into his laptop. The ignorance over the Japanese language is forgiven with the sumo parody, complete with the mawashi belts and TK in a full gyouji get-up. It's almost a breath of fresh air to see Devimon again, even if it's just briefly to give Leomon marching orders and await the final battle. We should not be so happy to see such a trite villain in such a trite scene. This episode was alright. Nothing spectacular, nothing awful. Just alright. It's best parts came after the conflict between Patamon and Elecmon was done and over with. Beforehand it was pretty light hearted and whimsical but that fit seeing as it's just TK, the youngest child, with Patamon, a childish Rookie, in a village filled with freshly hatched infant digimon being taken care of by another Rookie who's trying to act all grown up. I loved the moment where Patamon spontaneously starts crying and that gets TK's own crying to stop, and of course the pig Digimon evolution joke that followed. "I AM NOT A PIG, TK!" It's actually kind of sad that TK seemed to be suggesting that he wanted to talk things out with Devimon and reach a nonviolent solution to the big conflict as they managed with this one, but that's obviously not going to happen. However, Elecmon getting inspired to spread the gospel of friendship and band every good Digimon on the island together does pay off two episodes later. The highlight was the scene showing all the kids on their way back towards where Infinity Mountain is, and then Devimon making his plans. Really gets you pumped up for the upcoming finale to this story. And that ending with Leomon just standing there...chilling. One big dub nitpick, though? Elecmon's voice doesn't sound young enough, and his acting was questionable at points. Especially "Intruders, invaders!" Yeesh! Adventure Episode 09: Subzero Ice Punch!